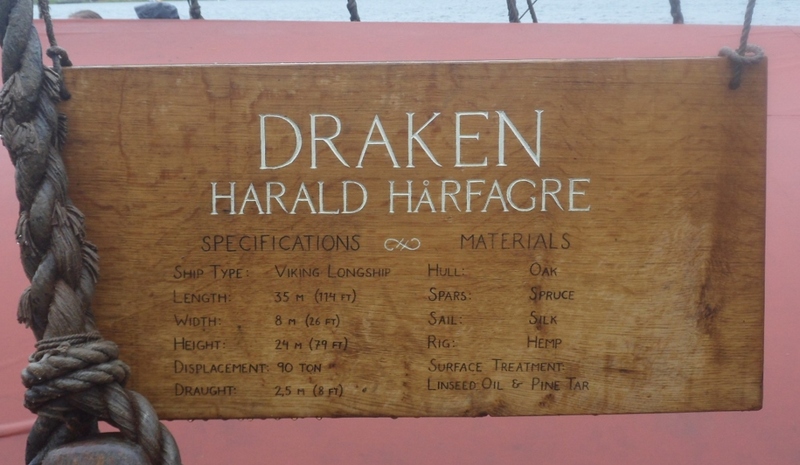 The Draken was mostly put to bed for the winter when we went to see her at Mystic Seaport on Leif Erikson's Day, the deck cleared and the sail stowed and bits of the decking pulled up to allow them to get down into the hold and clean her thoroughly and pump the last of the water out -- but she was BEAUTIFUL, all the same. 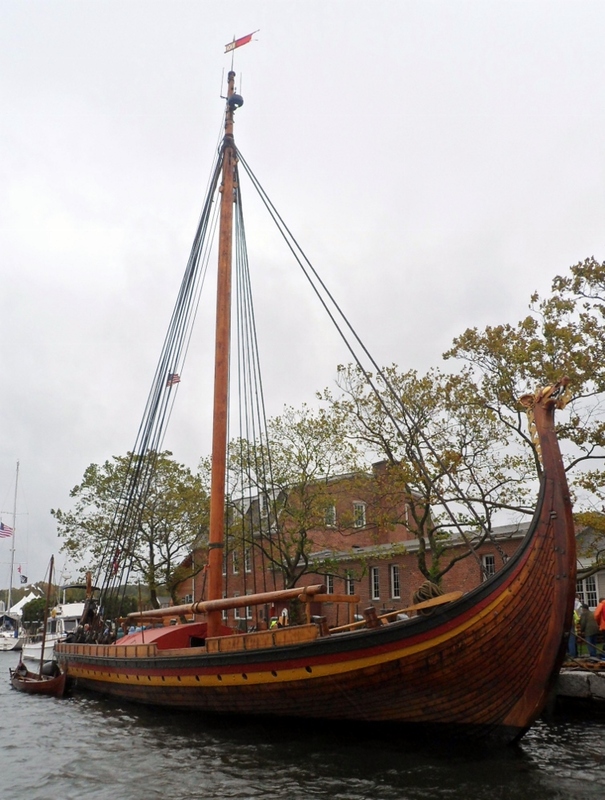 Maybe in the spring before she sails on and away, I'll get to see her again all decked out properly for a voyage, and the day won't be quite so miserable and wet and rainy. But the wet and the rain did make the hot Lobster Bisque soup taste that much better going down after we'd gotten our tour and had a chance to get out of the spitting wind. 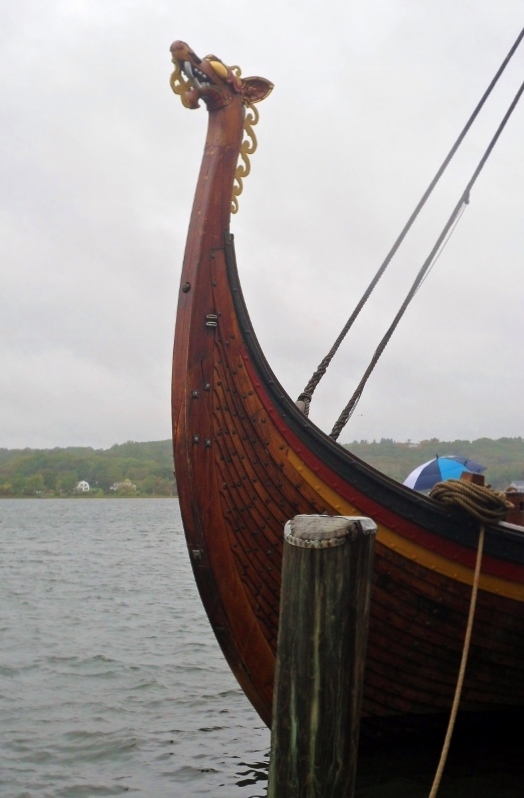 It seemed fitting though, somehow, to tour a viking ship on such a stormy day. And it sure offered some amazing perspective on those Norse and Icelandic voyages made during the Viking age. Voyages like the ones that Freydis and her brothers made, both with Eric the Red, their father, and apart from him. In DAUGHTER OF A THOUSAND YEARS, Freydis doesn't encounter any storms on her journeys to Vinland, but she sailed through her share of them when she followed her father to Greenland -- half the ships who followed Eric the Red from Iceland to his new colony in Greenland never made it to the shore, after all, and one of Leif the Lucky's stories involves him fishing out the survivors of a wreck from the water on his way back home. 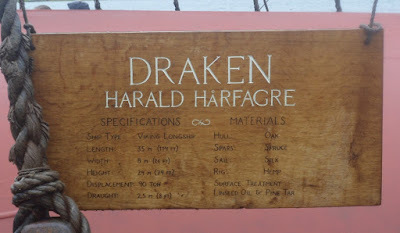 Going to see the Draken, talking to the crew who sailed her with a modern electrical pump to bail out the water that they took on along the way (because the deck isn't sealed, and any water that lands on it just ends up filling the hold), who when I asked "what did the Vikings do about the water they took on?" replied "they sank!" was a poignant reminder of how dangerous it was to sail in those days. Heck, it's still dangerous to sail in ours! Which is all to say that those Norsemen and Icelanders -- going exploring or a viking, either way -- they were stupid brave.